At last, a friend for Glenda! Theodore lost his American father in the Korean War, a victim of a booby trap explosive device. Vowing to protect his mother and his Argentinean homeland from such threats he joined the Fuerzas Armadas de la Republica Argentina (Armed Forces of the Argentine Republic) as soon as possible. While training as a bomb disposal technician, he was able to memorize the formulas of over 120 explosive chemicals, additives, fuels and other oxidizing agents. His mastery of this complex specialty, and his pristine record of successful field deactivations soon caught the attention of the Comandos Heroicos, the South American branch of GI Joe, and they recruited him immediately. His quick decisions and selfless actions have saved the lives of many soldiers since then. Theodore's job is to identify and determine the risk factor of ordnance including mines, unexploded conventional munitions and improvised devices (IEDs). His work could literally blow up in his face at any time. It takes a brave soul with steady hands and nerves of steel to handle these deadly devices. He's a dedicated soldier that never hesitates to make the "lonely walk" to defuse bombs, leaving others at a safe distance. 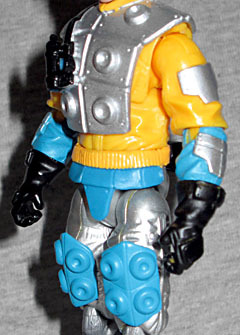 Theodore Nicolas Thomas, TNT, was one of the characters Plastirama created using the molds they rented from Hasbro - it was basically just a recolor of Blowtorch, and so is this toy. This is simply the G3 Blowtorch done in yellow, black and silver, almost perfectly matching the 1986(?) original. Back in the day, the pads on his thighs were the same color as his pants, his upper arms were blue below the silver armor plates, and the device on his chest was yellow rather than black. Still, those are only minor changes, and it's not like anyone is going to mistake this for a different blue, yellow and silver repaint of Blowtorch. Even his accessories are 100% recycled! 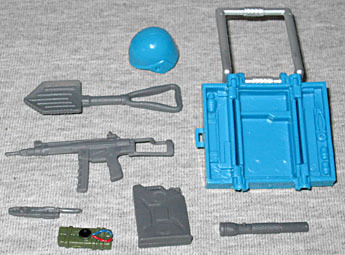 He has Blowtorch's helmet in blue (even though the original toy [and the modern filecard art] used Doc's helmet), the shovel that came on the VAMP, the same M-32 Pulverizer Cover Girl came with, and the "toolbox" backpack that originally came with a G3 Firefly and features a removable gas can, block of plastique, multi-tool and flashlight, in addition to having lots of other sculpted interior details. This is a very cool piece, every time it's released. TNT is definitely on the low half of the FSS1 lineup - he's not one of the main selling points for the subscription, because most people had never even heard of him until he was announced, and he's not very exciting as far as repaints go. If the figures were offered a la carte, this is one I personally wouldn't have bought. He's not the bottom of the barrel, though, and being able to expand the International Heroes collection is nice in its own way.